Well, first, a few links. Four years ago, Mike Matheny decided he would only coach a youth baseball team under certain conditions — mainly that parents stay quiet and that he would be free to make the game about the kids. Now, he wants to bring that to youth sports everywhere. I’ve written the Tony Pena story before, but in my view it can’t be written enough times. And this is especially true after Pena led the Dominican Republic to its stirring WBC Championship. My 68-second NCAA bracket is guaranteed to, well, it didn’t take long. But, as I ask around the game, I find that it’s a bit of a complicated question. How far should baseball go? Shouldn’t this be left up to the players? Can baseball change the rules enough to eliminate the home plate collision? Will doing that break the game from its history? Is a rule change an overreaction to recent incidents? And why ARE there home plate collisions when the rules are supposed to be the same at all bases? And lots of other questions. I have an opinion, which I’ll be writing about at length soon. But I’d love to hear what you think. Take the poll. And tap out your comments below. Frankly, I find the homeplate collision stupid – baseball is not a contact sport, and there shouldn’t be a defender trying to tackle you on the way to the base. That being said, I’m curious what “full contact baseball” would look like. Does the first baseman stand halfway down the line between first and home? Do you keep the same defensive orientation (and try to grab easy outs on fly balls), or do you work hard to just stop the player from making it to any base? Can I bring my bat to first base? Clarify the rules to specify that a catcher blocking the plate is interference. Any time a catcher attempts to block the plate, the runner will automatically be called safe. I’d also remind umpires that if a batter does not attempt to get out of the way, a hit-by-pitch should not be called. Chase Utley gets a ton of improperly-called free bases every year by crowding the plate (his hands are usually in the strikezone) and turning his body into path of the ball. And also clarify that a player who attempts to dislodge a ball from the tagging catcher (who is not blocking the plate) is automatically out, like A-Rod vs the Red Sox in the 2004 ALCS. Pete Rose also let balls hit him if he could take it in the upper arm. It was another annoying thing about him. You can’t block second base or run the second baseman. You shouldn’t be able to block the plate or run the catcher. Circling back to Matheny: When he played, he said he was okay with home plate collisions. Now, as a manager, he has come out against them. I wonder how many players say they’re okay with tough plays at the plate for fear of being labelled ‘soft’ if they say otherwise. Actually, there are no rules limiting the ability of this happening at other bases – there are actually no rules differentiating how tag plays should work at any base. The difference between 2nd/3rd base plays and plays at the plate is that the runner has to hold the base so running over a fielder is not effective. Conversely, only the catcher is allowed to wear padding so there is a disincentive for the other 8 fielders to stand in front of the other 3 bases. This is why you don’t see the 1st baseman or pitcher standing in front of home plate in the same manner the catcher does. Most of the “bad” home plate collisions are caused by poor catcher technique. I think teams value starting catchers more than one run in one game and after the Buster Posey one this should be a priority for teams. Let’s be clear here, Buster Posey broke his leg because of bad technique, and rules don’t fix flawed fundamentals. Minor league coaches will fix this or it won’t get fixed. I’m fairly certain that Posey wouldn’t have broken his leg if Cousins hadn’t gone inside the basepath to lower his shoulder into the tag and Posey’s non-glove side, where a halfway competent hook slide on the outside would have accomplished the same end without plastering somebody wearing a half-inch of foam padding. If we want to talk about poor technique, let’s talk about the runners who hit because they can’t evade, instead of indicting the players who aren’t initiating contact and usually cannot dictate the terms of contact. Chris, I have no skin in this game, I’m not a fan of either team or player involved. Cousins took a straight line towards home and did not deviate, that’s the baserunners job, not attempting a hook slide which is a lower percentage shot and requires pretty extreme levels of agility to pull off. Posey was in front of the plate and tried to block at the last second. He took a bad angle and got his leg under Cousins, who was running straight and inside the basepath. If Posey had tried to tag instead of block we wouldn’t be having this conversation. If Posey had blocked successfully and got both his feet under his center of gravity and his hips and shoulders square to the baserunner we wouldn’t be having this conversation. Posey went for the block, was too late and took a bad angle, and was injured as a result. You should google around a bit and check out Johnny Bench’s statements on the play, he has worked for decades as a consultant on proper defensive technique and he is a pretty harsh critic of the kind of sloppy play Posey attempted when he was injured. Those pictures are very clear. Cousins went for Posey and not the plate. All of those pictures are taken on an angle that makes it look like Cousins went way out of position, which isn’t accurate. Cousins stayed in a straight line until Posey turned into him to initiate the block, and at the last second Cousins dropped his shoulder into Posey. Posey initiated contact, and didn’t leave Cousins a lot of choice there. Watch the vids, most are from different angles and give a clearer view of Cousins relationship to the basepath and 3rd base line, and also show real time how fast this was. Cousins running straight, Posey turning into him, and in Cousins last step he turns into Posey and drops his shoulder (instead of letting Posey hit him low). Posey initiates the contact, Cousins just responds, and because Posey was late coming around he took the full force of the impact on one leg. Sorry, Scott. I looked at the photos and I took your advice to watch the videos from several angles. It might not serve your purposes to admit it, but for you to push the narrative that Cousins was anything but a headhunter is ludicrous. 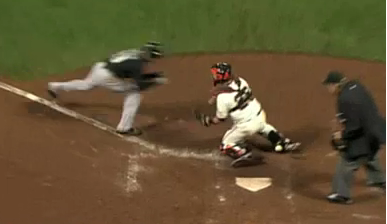 Posey was in front of home plate, and maybe, maybe, a portion of his outside left arm ever entered the basepath. Nonetheless Cousins bashed into Posey’s INSIDE right shoulder, far in towards the pitcher’s mound. Cousins could not have possibly even touched home plate from his position at that oint. Making it even worse, Cousins hit him with his own OUTSIDE right shoulder. The whole of Cousins body was even closer to the mound than where the point of contact was made. This was nothing but a first class hatchet job. Cousins should have been banned for a year. If you want to argue for MLB to adopt the rules of the Ultimate FIghting CHampionships, that would be one thing, although it is clear most of us here disagree. But to serve as Cousin’s apologist by telling us not to believe our lying eyes, when even you admit that the photos “makes it look like Cousins went way out of position,” surely goes beyond the pale. Dodger, watch the video again, and let me know which happened first: did Cousins drop his shoulder and turn into Posey first, or did Posey turn and try to block Cousins first? If Cousins moved first, he is, as you said, “a headhunter”, but if Posey moved first he initiated the collision and Cousins was reacting to him. I believe Cousins admitted he went inside on Posey to avoid being blocked, so I don’t agree that Posey “initiated contact”. Cousins had already made the decision to take out Posey. The comment about him being banned for a year is ludicrous, however. Runners know that catchers will bait them into sliding, then block them, so Cousins did the logical thing & it was a good hard baseball play…. based on how the rules are being interpreted and called on the field. Like others have said, if interference was regularly being called for blocking the plate without the ball, then Cousins likely slides and goes for the outside corner of the plate. Rather than clarify, I’d like to see the rules changed that the runner must slide (unless, of course, there’s no possibility of contact). I say no. It’ll break from its history no more than the changes in the ball have changed eras of the game. The rules are clear now. They’re just not enforced. Either enforce the rules or change them, but don’t have rules you don’t intend to follow. I am in total agreement with Scott. Let the players police themselves if there is a violation of the unwritten rules. What troubles me is the trend of sports, like society in general, into wussification. Preventing injuries through reasonable measures that don’t alter the game is not “wussification”. I tend to not worry too much about the opinions of people who use words such as ‘wussification’. It should be ruled like interference at any base. If the catcher is blocking access, the runner should be called safe. 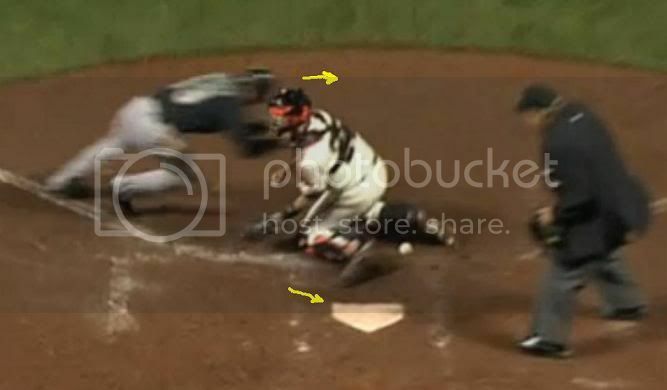 And if the player initiates contact when the plate is not blocked, he should be called out. Risk/Reward is WAAAAAYYY out of whack on this play. In both the ARod and the Chase U. scenarios, the rules are already there to have the outcome you’ve asked for. Same for home plate too for that matter, so just enforce what is already there. There is no new catcher rule you can come up with that will go any further than what is already in place other than silliness such as making the catcher lean over the baseline or runners must slide; both of those would only cause more accidents as far as I can see. I’m reading Mike Piazza’s book Long Shot. It further inclines me to change the rule, or the enforcement of the rule that plays at all bases are to prevent either blocking or taking out the fielder. Piazza stresses that under common practice (regardless of the rule), it doesn’t make sense to block the plate in a way that can disable you in an early inning, when you could help your team score runs later in the game. Football violence is foolish enough. There’s no reason baseball has to be played like football. “Hinson dropped the ball! Hinson Dropped the Ball! The ballgame is over Racine has won the game 3 to 2 and the world series. Any rule change that would make the ending of A League Of Their Own impossible is wrong. I remember reading an article, I think by Bill James, that claimed that, until the late thirties, these types of plate-blocking plays were routinely called as interference, *as the rules say they should be now*. I remember a quote from the “knotty problems” section of a depression-era rulebook being cited, where a typical modern-day blocking-the-plate case was described, and the conclusion was “of course this is interference”. We don’t need any new rules — just *enforce* the existing ones. I have to agree with the theme being expressed by many commenters: enforce the existing rules. Blocking the plate is interference. I’ll add this two things. 1) The rule change should not be left up to players. If it were, they would be more likely to opt for tradition at the expense of their own health to maintain a sense of pseudo-masculinity. When given the choice, people rarely choose change because what’s familiar is what’s comfortable. 2) It makes no sense for this play to be a part of baseball, a sport that doesn’t rely on collisions or body-to-body contact. To me, it makes sense that this type of thing evolved out of a desire to hyper-masculinize baseball in response to the growing popularity of football. But baseball shouldn’t try to be anything other than what it is. It’s a bat and ball sport not a body-on-body sport. Leave the rules alone for the runner-catcher engagements. Change them and we’ll be seeing the softer league’s “designated hitter”-fication of another baseball tenet. Still makes me boil when I see an AL pitcher plunk a hitter knowing he won’t suffer the consequences. How about changing the basball out of felt? May not go as far when hit but all will be safe within the confines of the diamond. What exactly do home plate collisions add to the sport? We didn’t always see these types of collision on plays at the plate; it’s not an inherent part of the game. When talented players have serious injuries in avoidable circumstances, it’s time to re-think how we do things. They didn’t use to have warning tracks, either. But there were too many injuries from players running into the walls, so they figured out a way to reduce those that didn’t change the game itself. What would happen if a runner tried to dislodge the ball by crashing into a defensive player at 2nd base? Or third base? Why should a play at the plate be any different … especially when serious injuries are often the result? I seem to remeber one A-Rod being involved in such an incident with Bronson Arroyo in 2004. He was excoriated for it. The American Youth Soccer Organization here in California has had Metheny-like rules in place for many years. Coaches must play every player a certain amount of time, fans, including parents, are not allowed to yell and scream or coach from the sidelines. I’ve seen parents removed from games many times for doing that. The result is a civil game that is fun for everyone: kids, parents, coaches, even referees. There are more collisions at home than other bases because 1) it’s the most valuable base (in a way it’s the *only* valuable base because it’s the only base that gets you on the board – reaching third safely counts for nothing), and 2) because, like 1st base, the runner is not in danger of being called out by overrunning the base, and therefore doesn’t need to slide to slow down his progress. The combination of these two variables leads to the *occasional* collision, even though the rules are the same at all bases. I wonder what percentage of plays at home plate (either runs or outs) entails a collision. I would guess 2% or less. I don’t think it’s a problem. If either the offensive or defensive player doesn’t want the contact, he can always avoid it. You see this especially (but not exclusively) with pitchers all the time when they give themselves up at home to avoid a collision. Or they can slide in such a way as to slow their progress or to avoid full body to body contact at full speed. Thus, all home plate collisions are not only consensual but mutually desired by both players involved. I see no problem with it whatsoever. I agree baseball (mercifully) isn’t a contact sport and doesn’t have that primal, bloodthirsty element that makes football so popular, and that is to baseball’s credit. But it doesn’t need to eschew all contact either. I think so changing the rules would result in catchers defending home or runners striving for home with less vigor, and, since home is the central location of the game, would water down baseball tremendously. Leave things as they are. The reason there are more home plate collisions is that it’s the only base that you only have to touch and not stay on. Any other base, you not only have to get there, but you have to stay on the base or get tagged out. That’s hard to do when you’re flattening an infielder. The only time you see it is when a runner knows they are out & are trying to break up a double play. Also, the catcher has the gear, so they can “open the door” and then “close the door” with their shin guard…. which in the comments above is rightly called interference most of the time. If a catcher blocks the base without the ball and umpires call interference, the catchers will quickly adjust & the runner no longer needs to fear the catcher “closing the door” & decide to run the catcher over. Without interference being allowed, the correct play for a runner will almost always be to find a corner of the plate with a slide. Problem solved. My feelings on this issue are not particularly fervent, but I lean toward outlawing any non-sliding collisions.